Musical Bouquet Edition. One Hundred Songs of Ireland: Words and Music. 60pp., 8vo. In green printed wraps, the front cover carrying a dense illustration of scenes from various songs ('Kitty of Coleraine', 'Angel's Whisper', 'The Irish Wedding', 'Donnybrooke Fair', 'Low-Back'd Car' and 'The Wake'), with Tom Moore at the head, printed by Richard Born from a drawing by W. E. Earl. Title on cover differs slightly: '100 Songs of Ireland | Music & Words | The Popular Edition'. Eight-page publishers' catalogue bound in at rear. In fair condition, on aged paper, in aged and worn wraps. 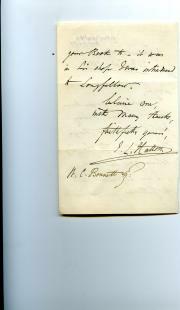 [ Julius Harrison, English composer, inscribes a work to Sir Courtenay Mansel. ] Copy of the printed sheet music of 'To Chloe | Song for Voice and Pianoforte | Poem by Thomas Moore | Music by Julius Harrison'. Printed score published by Enoch & Sons (in 'The Enoch Art Song Library'), London. Dated 'June 1920' Harrison's autograph inscription dated 26 October 1920. 4pp., 4to. Bifolium. Aged and creased, with chipping and closed tears to edges. Engraved title-page states that the work is 'Copyright 2/- net | No. 1 Low Voice | No. 2 Medium Voice'. 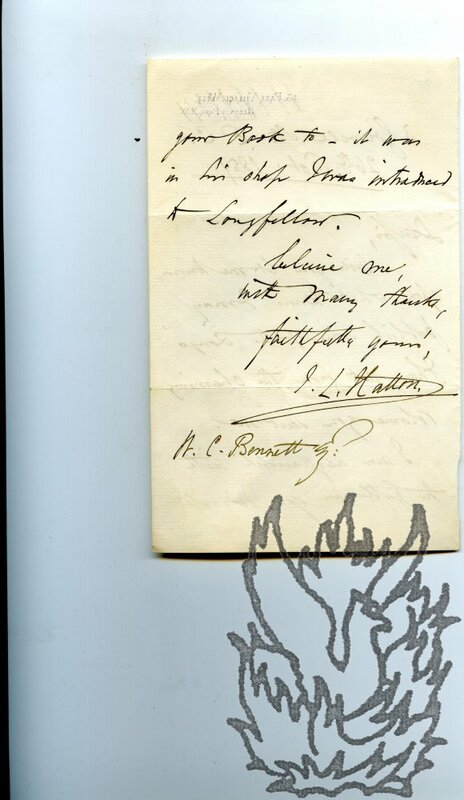 Inscribed at top left-hand corner of title-page: 'To my friend Sir Courtenay Mansel with kindest regards from | Julius Harrison | Oct. 26th. 1920'. Moore's poem is printed on the reverse of the first leaf, and facing it, on the recto of the second leaf, is the score. 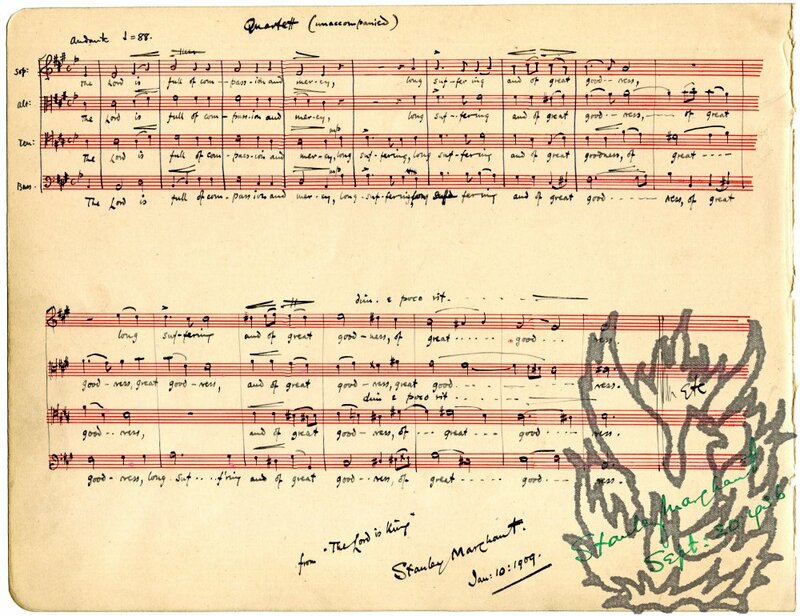 On the reverse of the second leaf is a 'Revised List' of 'The Enoch Art Song Library', with the date of issue ('June, 1920.') at bottom left. New Theatre [ London ]. 4 April 1920. 38 items, in fair condition, lighty aged and worn. The main item is the complete score, containing all the parts, on 12pp., folio, and signed at foot of last page: 'New Theatre | April 4th. 1920 | Henri Lucas'. This is accompanied by 37 parts for separate instruments, each 4pp.in a 4to bifolium. According to the British Film Catalogue a film by the title 'The Golden Ballot' appeared in 1920. [John Pyke Hullah, composer.] Autograph Letter Signed ('John Hullah'), sending tickets to 'Laura'. With cutting of a few bars of manuscript sheet music by him. Letter: On letterhead of 11 Devonshire Place, [London] W. 'Tuesday night' [no date]. Cutting of sheet music with docketted date 1861. '. With a few words in Hullah's hand at head. 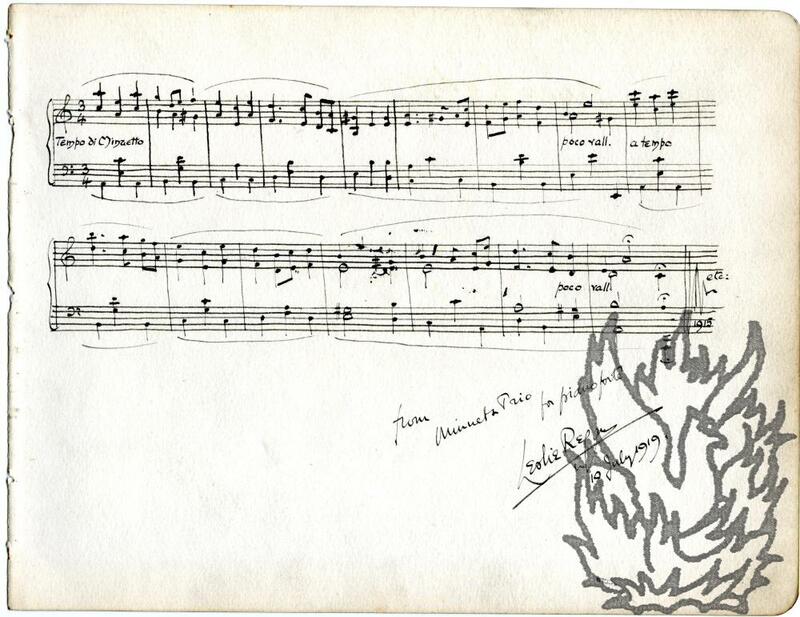 Signed Autograph Manuscript musical score of 'Interlude from "Bluebeard" '. On both sides of a piece of paper, roughly 18 x 23.5 cm, taken from an album. Very good, on lightly-aged paper. Thirty-two grand staff bars, in black ink, with title and signature in blue. 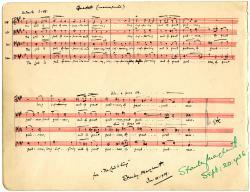 Signature, following the score, reads 'Douglas Hopkins | September 2nd. 1926'. 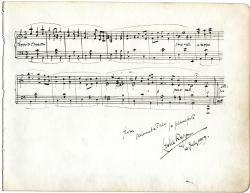 Autograph Manuscript musical score, 'from Minueta Trio for pianoforte', signed by 'Leslie Regan'. 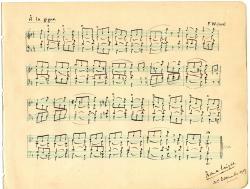 Autograph Manuscript musical score, entitled 'À la gigue. | F. W. (1924)', with autograph signature of 'Frank Wright' at the end. 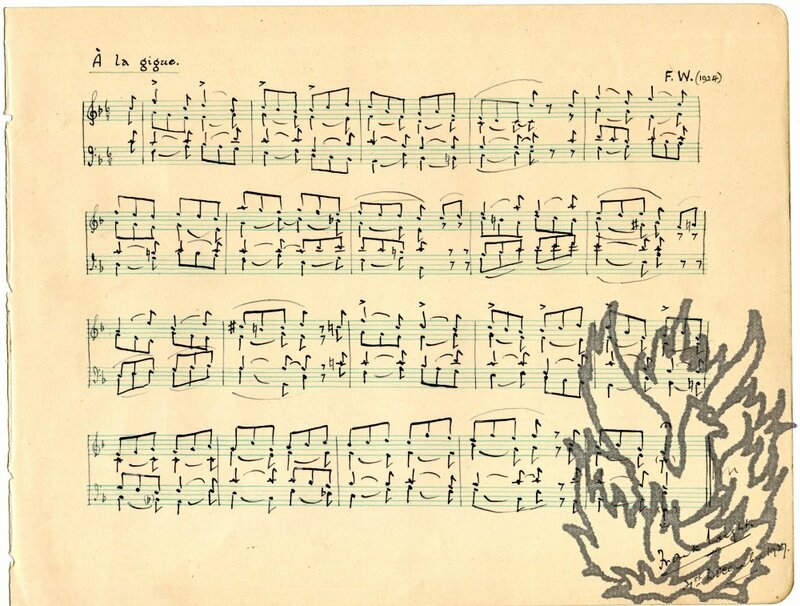 On one side of a leaf of pink printed music paper, roughly 18 x 23.5 cm, removed from an album. Very good on lightly-aged paper. Twenty-one grand staff bars. Signed 'Frank Wright. | 21st. December 1927.' in bottom right-hand corner. According to Newsome ('The Modern Brass Band'), Wright was 'a highly influential figure in the brass band movement'. Autograph Letter Signed ('J. L. Hatton.') to Bennett. 26 October 1859; 3 Goswell St. E.C. [London], on cancelled letterheada of 13 Park Village West, Regents Park. 12mo, 2 pp. Ten lines of text. Good. Asks 'upon what terms' he may 'publish some of the songs I have set from the charming volume you sent me'. He is 'acquainted with the Gentleman' to whom Bennett has dedicated his book: 'it was in his shop I was introduced to Longfellow'. Possibly referring to Bennett's 'A Sea Song' and 'The Sea-Boy's Dream', set to music by Hatton and both published in 1861.